When I first posted the two quilts I made for Quilt Market, many of you asked about the patterns. Cloud 9 Fabrics has posted the free projects sheets on their website! 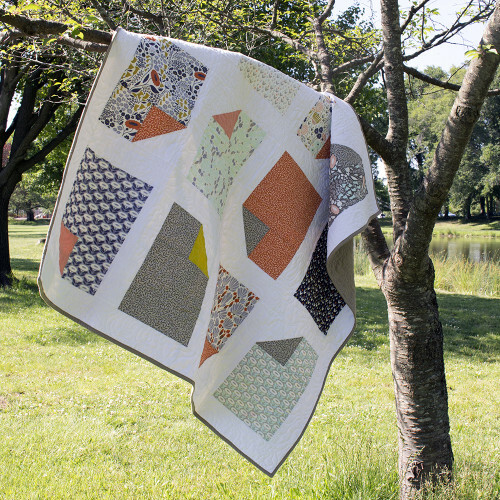 Sonnet by Elizabeth Olwen is the perfect, quick baby quilt that will show off all of your large prints! It looks like turned over pieces of paper. I can't wait to make another (I love that it looks more complicated than it actually is)! My version is below in Cirrus Solids and Elizabeth's new Morning Song Fabrics. Click here to see the free pattern and feel free to tag your progress with #sonnetquilt. 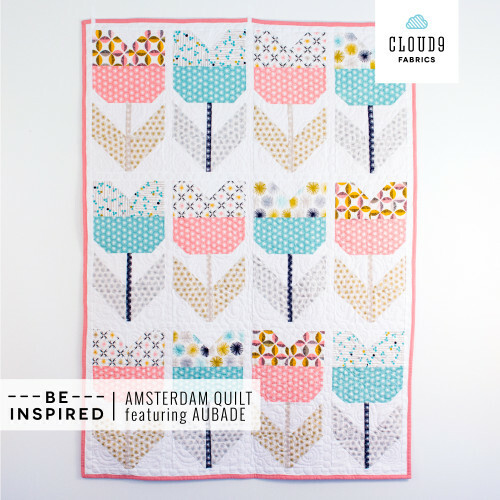 For something more playfully traditional, the free pattern for Amsterdam, written by Michelle Engel Bencsko, is available here (and many versions have been made already - check out #amsterdamquilt on Instagram!). Below is my version in Michelle's new Aubade fabric paired with Cirrus Solids. Both pictures are from the Cloud 9 website. Sonnet is great! What a simple effective design! Hurray! Fun to see your quilts being shown off around the interwebs.